In May 1998 the fall of Suharto marked the beginning of a difficult and multi-layered transition process. It was accompanied by intensified conflict in the political arena, a dramatic increase of ethnic and religious violence and the danger of national disintegration. Ten years after the collapse of the New Order, Indonesia has made significant progress, however the quality of democracy is still low. Theoretically innovative and empirically sound, this book is an in-depth analysis of the Indonesian reform process since 1998. 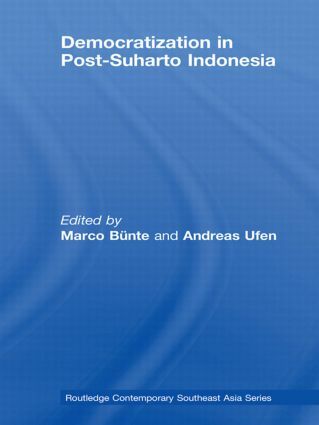 Marco Bünte and Andreas Ufen bring together a selection of noted Indonesia experts to provide new insights into the restructuring of core state institutions, the empowerment of Parliament, the slow and difficult evolution of the rule of law, and the transfer of power to locally elected regional governments (decentralization). Based on the results of extensive fieldwork, Democratization in Post-Suharto Indonesia will be an important read for scholars engaged in research on Indonesia and the politics of Southeast Asia.